L’étalement gravitaire, un précurseur au glissement de terrain de Stífluhólar (Skagafjörður, Islande du Nord) ? In Iceland, the Late Weichselian deglaciation led to paraglacial topographic readjustments in the form of extensive deep-seated gravitational slope deformation (DSGSD) and large rockslope failures (landslides and rock-avalanches). Here we provide age estimates for the Stífluhólar landslide (Tröllaskagi Peninsula, Northern Central Iceland), which indicate that this occurred between the end of the Late Weichselian deglaciation (15-13 ka cal. yr. BP) and 8200 ± 1400 cal. yr. BP. Our surface observations also suggest that the Stífluhólar landslide was probably initiated by propagation and connection of DSGSD failure planes. This observation suggests that the DSGSD can act as a precursor for landsliding in paraglacial settings. However, further investigations are still required to fully assess the role of DSGSD as a landslide precursor, both at the local and at a regional scale. Comparisons with other examples of paraglacial rock slope failures in Northern Iceland and in the world suggest that DSGSD is not the main or sufficient precondition for large landslides. The landslide of Stífluhólar occurred due to some combination of favorable preconditioning, predisposing and triggering controls. Predisposing controls include: the favourable dip of the bedding planes in the basaltic bedrock and the presence of intercalated poorly cohesive layers of palagonite between the lava layers, probably acting as basal sliding planes for the landslide. En Islande, la déglaciation du Weichselien tardif a conduit à d’importants réajustements topographiques paraglaciaires. Ces réajustements se déclinent sous la forme de processus de déformation du relief par étalement gravitaire (DSGSD) et de mouvements de masse (glissements de terrain et avalanches rocheuses). Dans cette étude, on apporte des éléments de datation au glissement de terrain de Stífluhólar, datations qui indiquent que celui-ci a été actif entre la fin de la déglaciation du Weichselien tardif (15-13 ka) et 8200 ± 1400 ans (âge calibré). Nos observations de surface suggèrent que les déformations par étalement gravitaire ont pu jouer un rôle dans le déclenchement des glissements de terrain. Des études plus approfondies sont néanmoins nécessaires pour confirmer pleinement le rôle de l’étalement gravitaire dans le développement des glissements de terrain, tant à l’échelle du site d’étude qu’à l’échelle régionale. Sur le plan de la discussion, la comparaison avec d’autres processus de réajustement paraglaciaire en Islande et dans le monde suggère néanmoins que les processus d’étalements gravitaires à eux seuls ne sont pas suffisamment efficaces pour déclencher des mouvements de masse. En effet, le glissement de terrain de Stífluhólar est le résultat d’une combinaison complexe de facteurs favorables à son déclenchement. Les paramètres structurels tels que le pendage des bancs de basaltes, conformes à la pente, ainsi que la présence entre ces bancs de couches peu cohérentes de palagonite ont joué un rôle déterminant dans son déclenchement. Article soumis le 6 juillet 2015, accepté le 26 février 2016. The authors thank those in charge of the radiocarbon laboratory of the Institute of Physics, Silesian University of Technology (Poland) and especially Dr Adam Michczyński for sample analysis, and the Laboratoire de Planétologie et Géodynamique at the University of Nantes (France), especially Christèle Guivel and Carole La, for the geochemical analyses of the tephra. We are also grateful to Helgi Páll Jónsson for his valuable help, logistic assistance and advice regarding tephra layers in Skagafjörður. The authors also thank Carol Robins for editing the English text, as well as the reviewers whose comments greatly improved the manuscript. Financial support was provided by the National Center for Scientific Research (CNRS) through the GDR 3062 ‘Polar mutations’ directed by Daniel Joly. Assistance was also received from LETG-Nantes-Géolittomer UMR 6554. The authors thank also David Jarman and an anonymous reviewer for constructive comments on the original manuscript. 1Rock Slope Failure (RSF) is a major paraglacial denudation process in mountains that have experienced glaciation and deglaciation sequences (Bovis, 1982; Ballantyne, 2002; Jarman, 2006; Wilson and Smith, 2006; Hewitt, 2009; Kellerer-Pirklbauer et al., 2010; Mège and Bourgeois, 201; McColl, 2012; Crosta et al., 2013). Transitions from glacial to non-glacial conditions can provoke RSF by altering the stability of deglaciated slopes in four different ways: (i) rock slope steepening by glacial erosion processes (Augustinus, 1995), (ii) removal of supporting ice along valley-side slopes (i.e. glacial debuttressing; Zischinsky, 1966; Ballantyne, 2002), (iii) bedrock stress release and viscoelastic crustal readjustments due to post-glacial unloading (Agliardi et al., 2001; Hippolyte et al., 2006; McColl, 2012; Cossart et al., 2014) and (iv) water infiltration in rock joints and associated weathering (Whalley et al., 1983; Bachmann et al., 2009). 2RSF encompasses a wide range of gravitational slope instabilities including: (i) bulk mountain ridge spreading, also referred to as sackung or deep-seated gravitational slope deformation (DSGSD) and (ii) landslides and rock-avalanches (Ballantyne, 1986; Jarman and Ballantyne, 2002; Jarman, 2006; Ballantyne, 2008). DSGSD is characterized by slow motions and limited slope displacements along distributed and disrupted failure planes producing typical ridge-top grabens, scarps and antiscarps associated with upslope and downslope dipping fractures along bulged upper slopes (Agliardi et al., 2001). Landslides and rock-avalanches involve more rapid displacements of material along a continuous detachment surface creating a formation of a discrete mass body deposit (Jarman, 2006). 3The identification of spatial relationships and possible causal links between DSGSD and landsliding remains controversial. Several authors have pointed out that DSGSD represents a transient state of gravitational instability that can eventually lead to landslides and rock-avalanches once a critical threshold is reached. The idea that DSGSD is a significant precursor of landsliding is supported by surface observations (Evans and Couture, 2002; Evans et al., 2006; Mège and Bourgeois, 2011; Gourronc et al., 2014), cosmogenic dating (Bigot-Cormier et al., 2005), spatial statistical analyses (Capitani et al., 2013) and numerical modeling (Bachmann et al., 2009; Bouissou et al., 2012). But DSGSD is not necessarily a significant factor in explaining the causes and spatial distribution of landslides. In the coastal mountains of British Colombia, Hewitt et al. (2008) noted that many ridges are affected by DSGSD while very few of these are associated with rock-avalanches. 4In northern Central Iceland, the basaltic mountain of the Tröllaskagi Peninsula exhibits many post-glacial landslides (Jónsson, 1957; Whalley et al., 1983; Pétursson and Sæmundsson, 2008) and two of them have been recently dated, respectively between 9000 and 8200 ± 50 cal. 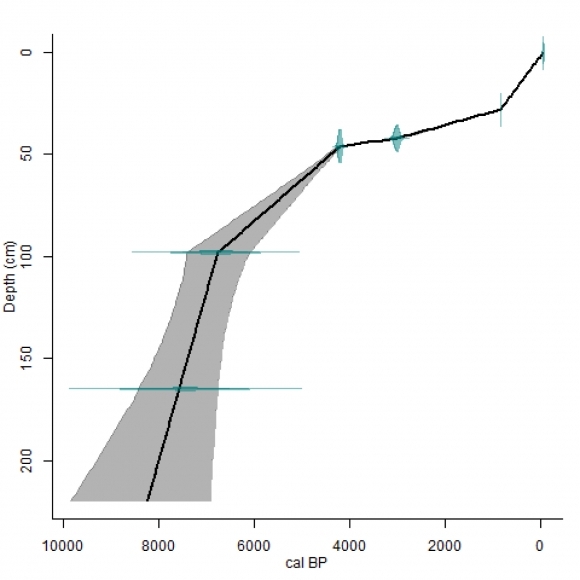 yr. BP (Mercier et al., 2013) and between 11400 and 10800 cal. yr. BP (Decaulne et al., 2016). Fewer studies have been devoted to DSGSD in this region, although numerous ridges exhibit evidence of this kind of slope deformation. On the bases of surface observations, Coquin et al. (2015) suggest that slope deformations have probably occurred during the Late Weichselian deglaciation while valleys are still partly occupied by glaciers. But the timing and kinematic of the DSGSD remain poorly known because these observations were carried out only along one single ridge of the Skagafjörður and absolute dating are still lacking. Cossart et al. (2014) and Feuillet et al. (2014) have highlighted the role of the post-glacial rebound to explain the spatial distribution of landslides in Skagafjörður. Also, Cossart et al. (2014) note that DSGSDs may promote landsliding in the region but such an influence remain not clearly demonstrated. Hence, there are still many issues regarding the potential role of DSGSD to trigger landslides in such a litho-stratigraphical uniform setting. 5Located north of the Skagafjörður area, the basaltic Holtshyrna ridge is affected by a contiguous and nested assemblage of DSGSD features and landslides. Thus, this ridge represents an interesting site of investigation to address these issues, which can be summarized in the form of the following questions: (i) Are DSGSD and landslides of the Holtshyrna ridge necessarily related or not? Is DSGSD a transient stage of slope instability, which can eventually lead to landsliding in this area? (ii) Can a causal relation between DSGSD and landslides be established on the basis of surface observations and age-measurments? To give new constraints to these questions, we first combine surface observations and age measurements on the Holtshyrna ridge. Then, we discuss the relationship between DSGSD and landslides on a larger scale, by comparing these local observations with other studies in Northern Iceland and in the world. 6The Tröllaskagi peninsula is a mountain plateau dissected by cirques and troughs and bounded by two fjords striking north, Skagafjörður in the west and Eyjafjörður in the east. The Holtshyrna ridge is located in the northwestern part of the peninsula. It stands generally between 500 and 800 m. a.s.l. and locally culminates at 1020 m. a.s.l. It strikes NNW and extends over 12 km between the Fljótaá valley in the west and the Holtsdalur trough in the east (fig. 1). Fig. 1 – Location maps. Fig. 1 – Cartes de localisation. A: Location map of the study area in Iceland; B: location map of the Stífluhólar landslide in the Holtshyrna ridge; C: aerial orthophoto of the Stífluhólar landslide; D: panoramic photograph looking south with the main landslide deposit in the foreground and Lake Stífluvatn in the background; E: interpretative transversal profile of the main landslide. C : orthophoto du glissement de terrain du Stífluhólar ; D : photographie panoramique prise vers le sud avec vue sur le dépôt principal de glissement au premier plan et avec le lac du Stífluvatn au second plan ; E : profil topographique interprétatif du principal glissement de terrain. 7The bedrock of the ridge is a pile of closely-jointed basaltic layers that dip gently (12° on average) westward, interbedded with poorly cohesive red vesicular layers. These red layers are usually of a decametric thickness and may represent 15 to 20% of the total height of the rockwall (Cossart et al., 2014). Their composition is produced by various processes including palagonization, weathering and thermal metamorphism of the bedrock which may reflect periods of volcanic quiescence (Roaldset, 1983). These poorly cohesive layers are considered as potential detachment planes (Jónsson, 1957; Mercier et al., 2013). This hypothesis is not clearly demonstrated as the basal part of landslide headscarps are generally buried under scree deposits. The basaltic pile is 10 to 15 Ma old (Jóhannesson and Sæmundsson, 2009) and is intersected by an assemblage of dykes, sills and faults, which developed between 3 and 7 Ma (Garcia et al., 2003). 8The western slope of the ridge can be subdivided into 3 distinctive areas, which differ in slope gradient and shape (fig. 2). The first area is located north of the Stífluhólar landslide. Its upper part consists of an assemblage of stair-cased low-gradient (10-15°) dip slopes, 700-1000 m in length and standing between 500 and 660 m. a.s.l. Its lower part is steeper (between 20 to 35°) and is separated from the upper part by a sharp break-in-slope. The second area is the Stífluhólar site. The third area is located south of the Stífluhólar landslide and exhibits a constant 20-25° slope gradient. 9The western slope of the ridge is affected by several landslides. In this study, we focus on the largest of them, the landslide of Stífluhólar (18°58’50”W and 65°59’30”N). This landslide is of a 4.1 km² with a cavity width of 800 m., a 3.25 km long runout distance and a H:L ratio of 0.15. 10A geomorphic survey based on field observations and remote imagery analyses was carried out to identify and map the range of RSF features observed in the study area. A detailed field examination was carried out on the Stífluhólar landslide and on the slope above to identify brittle deformation related to DSGSD (ridge-top trenches, scarps and bulged slopes intersected by antiscarps). Remote imagery analyses were performed on high-resolution aerial imagery (ja.is/skipulag.is/ and Google Earth) combined with the 30 x 30 m resolution ASTER DEM from METI and NASA. RSF features were recognized according to the classification of Jarman (2006), which provides a support to distinguish DSGSD features from the variety of translational landslides (cataclasmic, subcataclasmic or arrested slides), based on the amount of displacement. 11To constrain the timing of RSF, a methodology similar to that described in Mercier et al. (2013) was used, combining (i) radiocarbon age measurement, (ii) tephrochronology and (iii) age-depth model calibration. Six pits were excavated in the Stífluhólar landslide deposits, following a longitudinal profile from the distal part at 109 m a.s.l. to the proximal part, in contact with the landslide south-facing sidescarp. One pit was also excavated in a peat area at 336 m a.s.l. on a secondary landslide, which occurred after the main landslide event. Most pits were excavated in local depressions over the landslide body, sufficiently enclosed to trap water and sediment influx and so record soil and slope dynamics that occurred after the landslide event. Such settings, favored the development of birch-juniper woodland during the early-Holocene cooling sequences (Björck et al., 1992). 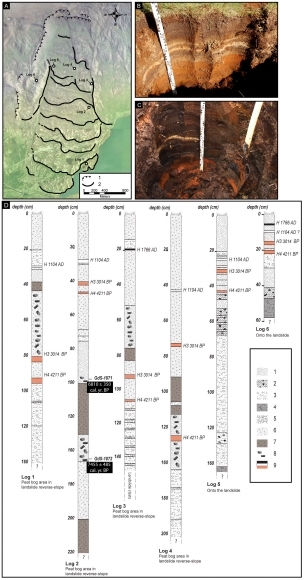 Two samples of wood remnants were extracted within organic-rich layers found in the deepest parts of several pits, providing suitable organic material for radiocarbon age measurements. The selected samples were analyzed at the Gliwice radiocarbon laboratory of the Institute of Physics, Silesian University of Technology (Poland). The radiocarbon ages for the two samples GDS-1871 and GDS-1872 were calibrated with OxCal v4.2.4 software (Bronk Ramsey and Lee, 2013) and atmospheric curves with Intcal13 (Reimer et al., 2013). 12Sediments trapped in depressions over the landslide also include ash layers (tephra) originating from explosive volcanic events. When these tephra were found in lacustrine deposits, the radiocarbon age measurement of the organic layers found in direct stratigraphic contact with the tephra provided chronological constraints for the age of the volcanic event. In addition, the emissive volcano was identified by geochemical analyses of the tephra glass shards. 13Five tephra layers originating from the Mt Hekla volcanic system have been described in post-glacial sediments in the Skagafjörður area (Larsen and Thorarinson, 1977; Larsen and Eiríksson, 2008). Four of these are present in the Stífluhólar pits and include: (i) the two H3 and H4 light-ocher colored silicic tephras, dated at 3014 ± 50 cal. yr BP and 4211 ± 31 cal. yr BP, respectively (Dugmore et al., 1995), (ii) the H1 white colored rhyolitic tephra corresponding to 1104 AD (Larsen and Eiríksson, 2008) and (iii) a dark colored basaltic tephra corresponding to either the 1300 AD or the 1766 AD volcanic events (Larsen and Eiríksson, 2008). The dark colored basaltic Saksunarvatn tephra layer has also been observed at several locations in Skagafjörður (Guðbergsson, 1975; Jónsson, 2005). It corresponds to a major eruptive sequence, which occurred at the Pleistocene-Holocene transition, around 10.2 Ka BP (Grönvold et al., 1995; Birks et al., 1996; Thordarson and Höskuldsson, 2008; Geirsdóttir et al., 2009). The presence of the Saksunarvatn tephra was suspected on the Stífluhólar landslide, given the presence of dark glass shards found in hard sand-clay layers in several pits. Several samples were collected in these layers and chemical analyses to characterize their major element composition were performed at the Laboratoire de Planétologie et Géodynamique (Nantes University). However the geochemical analyses of the material sampled in these layers have unequivocally rejected this hypothesis. 14RSF extends for about 8 km along the western flank of the Holtshyrna ridge (fig. 2). The ridge crest is dominated by extensional deformation along single to multiple high-angle outward dipping fractures associated with steep-sided grabens. The bulged upper slope is characterized by extensional features in the form of minor scarps and antiscarps. The lower slope is affected by landslides. Fig. 2 – Morphological map of the Holtshyrna ridge. Fig. 2 – Carte morphologique du massif du Holtshyrna. 5: Drainage; 6: Lake; 7: Dip of lava pile. 1 : ligne de crête ; 2 : Secteur affecté par les déformations par étalement gravitaire ; 3 : Déformation par étalement gravitaire ; 4 : Glissement de terrain ; 5 : Réseau hydrographique ; 6 : Lac ; 7 : Pendage de la pile de lave. 15In the northern part of the study area, the ridge crest exhibits a major fault scarp 1400 m in long and 30-50 m in high (profiles AA’, BB’ and CC’ – fig. 3). Locally, the ridge crest also exhibits multiple scarps, resulting in the formation of a double-crested ridge (profile BB’ – fig. 3). The fracture assemblage displays a N-S to NNE-SSW orientation aligned with the adjacent valley slopes, a feature indicative of gravitationally-driven deformation. The vertical displacement along the master fault decreases southward as the slope crest cross-profile becomes more convex (profiles DD’ and EE’ – fig. 3). Between profiles EE’ and FF’, the ridge crest has experienced remarkable bedrock deformations along multiple inward dipping fault scarps, producing multiple crestal ridges and bulging on both the western and eastern slopes of the ridge (fig. 4A). The scarps are 100 m in length, 5-8 m in height and display a segmented shape in planform, sub-parallel to the elevation contours. The northern part of the ridge exhibits a fault scarp 1.6 km in length and 40 m in height, which divides the upper slope into two low-angle slope surfaces (profiles BB’ and CC’ – fig. 3). Above and below this scarp, the bedrock deformation consists of an assemblage of scarps and antiscarps, 300-500 m in length and 1-5 m in height. Most of these brittle features strike N-S or NNE-SSW and are slope-parallel. At the southernmost part of the mountain ridge, the ridge crest exhibits a 20-40 m high scarp produced by a slip along a major outward dipping (profile II’ – fig. 3). South of the Stífluhólar site, the upper slope deformation consists mainly of a bulged slope intersected by antiscarps (profiles FF’, GG’, HH’ and II’ - fig. 3). The antiscarps display NNW-SSE to NNE-SSW orientations and converge northward. They are straight or faceted, 100-1000 m in length and 1-10 m in height. Fig. 3 – Transverse elevation profiles along the Holtshyrna ridge extracted from the ASTER DEM. Fig. 3 – Profils d’altitude transversaux réalisés le long du massif du Holtshyrna et extraits à partir du MNT ASTER. Note the transition between the upper slopes affected by DSGSD and the lower slopes affected by landslides. Noter la transition entre la partie haute du versant soumise au processus de déformation par étalement gravitaire et la partie basse, affectée par des glissements de terrain. 16In conclusion, the upper slope of the Holtshyrna ridge consists of an assemblage of extensional bedrock deformation typical of DSGSD, with near-surface outward dipping and inward dipping fault scarps along bulged slopes (fig. 4A, B, C and D). Fig. 4 – Views of the Holtshyrna ridge geomorphological units (DSGSD and landslide features). Fig. 4 – Vues sur les entités géomorphologiques du massif du Holtshyrna (déformations par étalement gravitaire et glissements). B : vue sur la partie haute du versant, directement au sud du Stífluhólar – noter la succession d’escarpements à regard amont, de 5 à 8 m de hauteur, étagés et alignés sur les courbes de niveau ; C : vue sur le revers d’un escarpement à regard amont ; D : vue vers le nord. Noter au premier plan les déformations par étalement gravitaire et à l’arrière-plan, la partie distale du dépôt de g du Stífluhólar ; E : vue sur la partie nord du massif du Holtshyrna – noter que le plan de glissement est aligné sur les déformations par étalement gravitaire de la partie haute du versant (soulignées par les névés) ; F : vue sur le glissement de terrain du Stífluhólar depuis le versant opposé – noter que le dépôt a barré le fond de vallée, provoquant la formation en amont du lac de Stífluvatn ; G : Vue sur le dépôt de glissement du Stífluhólar depuis la partie supérieure nord du versant ; H : Vue sur la partie distale du dépôt de glissement du Stífluhólar, vers le nord-ouest. Au premier plan, la fosse 2 qui a été excavée dans une tourbière. 17The toe of the western slope of the Holtshyrna ridge is covered by landslide deposits (fig. 2) that originated in the 12° west-dipping basaltic sequence. They consist of mostly translational failures of bedrock two-sided wedges controlled by discontinuities in the lava pile. The landslide deposits exhibit a wide range of run-out displacement magnitudes, from long-traveled (i.e. sub-cataclasmic landslides) to short-traveled (i.e. arrested landslides). The former display well-defined landslide mass bodies disconnected from their source area and exhibit sharp head/sidescarps. The latter are characterized by poorly-defined mass bodies and unclear head/sidescarps as their deposits have remained partly in their source area. 18The Stífluhólar landslide is characterized by an exceptionally long run-out distance and includes sliding and flowing processes (fig. 4E and F; fig. 5). The landslide originated in a low-gradient slope (20-25°) and at an elevation ranging from 640 to 690 m a.s.l. (profile EE’ – fig. 3). The cavity is framed/enclosed by (i) a west-facing headscarp with a steep slope (50°), approximately 100 m in height and 800 m in width, (ii) a south-facing sidescarp 140 m in height and 1.2 km in length. Above both the headscarp and the sidescarp, the upper slope is affected by DSGSD scarps and antiscarps 300-500 m in length and 1-5 m in height. The main deposit is 3.7 km² and exhibits an elongated shape stretching westward over 3.25 km; it is 800 m in width in its proximal part and reaches a maximal width of 1.7 km in its distal part. At the toe, the top of the deposit stands 30 to 50 m higher than the valley floor, providing an approximate of the thickness of the landslide. The landslide deposit is crossed by a succession of transverse ridges, 30 to 50 m high, approximately slope-parallel. Peat bogs and small lakes have formed in the hollows between the ridges. The landslide has dammed the Fljótaá river and formed Stífluvatn lake. 19Rockmass disintegration appears nearly complete. Exposed sequences suggest that the fabric from the source area is poorly preserved with only a few angular blocks embedded in a fine matrix of pulverized rock. A secondary landslide occurred after the main landslide event. The western part of the main sidescarp has been affected by a two-part rotational landslide extending over 0.3 x 10⁶m² (fig. 5A). Adjacent to this, a smaller landslide also occurred (fig. 5B). The proximal part of the main landslide deposit is overlain by a more recent landslide deposit (fig. 5C), which also indicates that the Stífluhólar landslide system experienced more than one period of activity. Fig. 5 – Geomorphological map of the Stífluhólar landslide. Fig. 5 – Carte géomorphologique du glissement de terrain du Stífluhólar. 3: Rotational landslide; 4: Other slope deposits; 5: Scree; 6: Main transversal ridges; 7: Contour of landslide deposit; 8: Landslide scarp; 9: Sliding plane; 10: Break-in-slope; 11: Fault; 12: Counterscarp; 13: DSGSD scarps; 14: Direction of slide; 15: Drainage; 16: Peat bog area; 17: Lake; 18: Road; 19: Elevation point; 20: Ridge crest. 1 : Dépôt de glissement principal ; 2 : dépôt de glissement translationnel secondaire ; 3 : glissement rotationnel ; 4 : Autre dépôts de pente ; 5 : éboulis ; 6 : principaux bourrelets de glissement ; 7 : contours de glissement ; 8 : escarpement de glissement ; 9 : plan de glissement ; 10 : rupture de pente ; 11 : faille ; 12 : escarpement à regard amont ; 13 : déformation par étalement gravitaire ; 14 : direction du glissement ; 15 : réseau hydrographique ; 16 : tourbière ; 17 : lac ; 18 : route ; 19 : altitude ; 20 : Ligne de crête. 20The headscarp of the northernmost landslide of the Holtshyrna ridge is connected to a DSGSD scarp, which suggests that the landslide failure plane is derived from a failure plane initiated by DSGSD (fig. 4E). The deep-seated hollow depression formed by the Stífluhólar landslide is surrounded by extensive DSGSD deformation (i) on the adjacent northern slope, above the steep south-facing sidescarp and (ii) on the adjacent eastward slope, above the main headscarp. This observation supports the idea that the Stífluhólar landslide occurred on a slope previously affected by DSGSD. In several other places along the ridge, landslide headscarps are located in the extension of areas affected by DSGSD, which suggests that the landslide headscarps were initiated along DSGSD failure planes (profiles AA’, CC’, DD’ and EE’ – fig. 3). 21Of the 61 DSGSD scarps and counterscarps mapped in this study, 38 strike between 355° and 30° north while 25 of the 45 landslide headscarps also strike between 355° and 30° north. Thus, 71% of the landslide headscarps display a similar orientation to the DSGSD faults (fig. 6). These spatial relationships support the hypothesis that DSGSD can act as a significant contributor to landsliding. To be fully addressed, such a hypothesis needs however a more detailed joint-set analyses and slide dynamics studies. Fig. 6 – Orientation of DSGSD features compared with orientation of landslide headscarps and sidescarps. Fig. 6 – Orientations des structures de déformation par étalements gravitaire comparée à celle des escarpements frontaux et latéraux des glissements de terrain. Both display a similar orientation. Ils présentent tous des orientations similaires. 22The excavated pits exhibit at least three of the five Hekla tephras commonly observed in Skagafjörður (fig. 7). The tephra H 1104 AD is present in all the pits except log 3, while the basaltic tephra H 1766 AD is only observed in logs 3 and 6. The oldest Hekla tephras H3 and H4 were found over the main landslide (logs 1–5) and in the secondary landslide deposit (log 6) indicating that the Stífluhólar landslide occurred before 4211 ± 31 cal. yr. BP. The thickness of the post-landslide sediments observed under this chronological benchmark in the excavated pits suggests that the landslide is much older. In log 2, an age of 6810 ± 350 cal. yr. BP (GdS-1871) and 7455 ± 485 cal. yr. BP (GdS-1872) was obtained for wood macrorests collected in soils located 52 cm and 119 cm, respectively, under H4 (tab. 1). Tab. 1 – 14C radiocarbon age measurement. Tab. 1 – Dates radiocarbone. Fig. 7 – The Stífluhólar landslide. Fig. 7 – Le glissement de terrain du Stífluhólar. A: location of the log sections mapped on an aerial view of the Stífluhólar landslide. 1: landslide scarps; 2: landslide transverse ridges. B: upper part of the log 6 section dug in the landslide deposit. In light ocher, tephras H3 and H4. C: lower part of the log 4 section dug in the peat bog area. Light patches correspond to wood remnants. D: sediment profiles and interpretation of deposits. 1: soil; 2: soil with clasts; 3: clay; 4: hard black sandy clay; 5: minerogenic; 6: peat; 7: peat with wood remnants; 8: wood remnants; 9: tephra ash layers. A : localisation des fosses cartographiées sur l’orthophoto du glissement de terrain du Stífluhólar. 1 : escarpement de glissement ; 2 : bourrelets de glissement. B : partie supérieure de la fosse 6 excavée sur le glissement. En ocre clair, les tephras H3 et H4. C : partie inférieure de la fosse 4 excavée dans une tourbière. Les taches claires correspondent à des macro-restes végétaux. D : profils sédimentaires et interprétation des unités stratigraphiques. 1 : sol ; 2 : sol avec cailloux ; 3 : argile ; 4 : argile à sable noir induré ; 5 : lits de cailloutis ; 6 : tourbe ; 7 : tourbe avec macro-restes végétaux ; 8 : macro-restes végétaux ; 9 : couches de tephras. 23These wood-rich soil layers suggest that woodland formed within the depressions on the landslide during the Atlantic, a period that experienced the cool and moist conditions that favor the woodland development in Northern Iceland (Stötter et al., 1999; Caseldine et al., 2006). The pit bottom is located 55 cm under this oldest sample and 220 cm under the topographic surface, indicating that the landslide is older than 7455 ± 485 cal. yr. BP. This age remains however underestimated as the contact with the landslide deposit is deeper than the pit bottom. An age-depth model was established to constrain better the minimal age of the landslide. Following a methodology proposed by Blaauw (2010), using the CLAM software and the free statistical software R, the age-depth model was designed to extrapolate the age of layers at the pit bottom from ages measured at higher levels in the pit. The age-depth model was only carried out for pit 2, which was the only one to fulfill all the conditions required to obtain an age estimation with a 95 % confidence range. Several kinds of extrapolation functions were tested: linear, polynomial, smooth spline and cubic spline. The best fit was obtained with a linear function (fig. 8). For the lowest soil layer at the pit bottom, the age-depth model provides an estimated age of about 8200 ± 1400 or 9700 ± 1500 cal. yr. BP from models using respectively a linear or a smooth spline extrapolation function (tab. 2). Without geotechnical support to excavate the pit further, the thickness of the soil layer between the pit bottom at 220 cm and the contact with the landslide clasts remains unknown. Hence, the age-depth model age estimates are probably still underestimated. The top of the landslide deposit was probably only reached in log 3, 40 cm under H4 and 160 cm under the topographic surface. An age-depth model could not be established for this log, given the lack of age-constrained layers there. In other logs, the thickness of the soil layer between H4 and the bottom of the pit ranges between 36 cm (log 6) and 174 cm (log 2). Fig. 8 – Age/Depth plot carried out for the pit 2. Fig. 8 – Graphique Age/Profondeur réalisé sur la section 2. The age is obtained on the basis of a linear extrapolation function. L’âge est obtenu sur la base d’une fonction d’extrapolation linéaire. Tab. 2 – Age-depth model results. Tab. 2 – Résultats du modèle âge-profondeur. 24Absolute age measurements are lacking to constrain the Stífluhólar landslide into a narrower chronological frame. However, the presence of well-preserved transverse ridges with sharp scarps and steep slopes in the distal part of the landslide suggests that the landslide event occurred after the last stage of deglaciation. Otherwise, the ridges would probably have been smoothed by the glacier and/or buried under glacial deposits. A post-glacial origin for the landslide is also supported by stratigraphic observations in six logs. There is no evidence of glacial till in log 3, the only one displaying a complete post-landslide stratigraphic sequence as it reaches the landslide material. The timing of the Late Weichselian deglaciation remains uncertain in Iceland, but ages of 15-13 ka cal. yr. BP have been proposed from core studies on the marine shelf (Andrew et al., 2000; Eiríksson et al., 2000; Geirsdóttir et al., 2002; Andrews and Helgadóttir, 2003) and from radiocarbon dating on raised beaches (Ingólfsson and Norðdahl, 1994; Norðdahl and Pétursson, 2005). 25The absence of the Saksunarvatn ash tephra layer (10.2 ka cal. yr. BP) in all six excavated pits might suggest that the landslide occurred after 10.2 ka cal. yr. BP. However, this assumption remains uncertain. First, the spatial distribution of the Saksunarvatn tephra fallout can vary from one location to another, given local topographic, atmospheric and meteorological conditions. Second, even if the fallout occurs, slope processes along freshly exposed and denudated landslide surfaces can rapidly wash out the tephra downslope. Third, with the exception of pit 3, the Saksunarvatn tephra layer might have survived on landslide slopes but at a deeper location than the pit bottom. Thus, a landslide age older than 10.2 ka cal. yr. BP cannot be excluded. 26To summarize, we can conclude that the landslide event of Stífluhólar occurred after the end of the Late Weichselian deglaciation (around 15-13 ka cal. yr. BP) and before 8200 ± 1400 cal. yr. BP (minimal age). Thus the landslide can be end-Pleistocene in origin or early-Holocene. 27In the paraglacial exhaustion model proposed by Cruden and Hu (1993) and Ballantyne (2002), deglaciation is followed by slope deformation and failure, a paraglacial activity that tends to decrease over time. Based on cosmogenic isotope exposure ages carried out on 31 RSFs in Scotland and Northwestern Ireland, Ballantyne et al. (2014) found that the timing of landslide activity spans the entire post-glacial times, from 18.2 ± 1.2 ka to 1.7 ± 0.2 ka, with a peak at 1600-1700 years after deglaciation. From a worldwide review of available age measurements of prehistoric landslides, McColl (2012) concluded that most of them occurred some thousands of years after the Late-Glacial ice recession, around 10-8 ka cal. yr. BP. This time-lag between deglaciation and landslide activity is also observed in Iceland. In the Skagafjörður area, the age of two landslides was constrained by combining raised-shorelines, radiocarbon age measurements, tephrochronology and age-depth models : (i) the Höfðahólar rock-avalanche (65°59’9.63”N and 19°23’15.97”W) occurred between 9000 and 8200 ± 50 cal. yr. BP (Mercier et al., 2013) and (ii) the Vatn landslide (65°57’21.8”N and 19°23’45.54”W) was activated between 11400 and 10800 cal. yr. BP (Decaulne et al., 2016). As they are located beyond the Younger Dryas maximal ice-extent, the Höfðahólar rock-avalanche and the Vatn landslide occurred on slopes deglaciated since the Late Weichselian at around 15-13 ka cal. yr. BP, meaning that they occurred around 4000 to 7000 years and 1500 to 4300 years, respectively, after deglaciation. Several other pits have also been investigated in other landslide deposits in the Skagafjörður area. Tephra H4 is systematically found in the excavated pits, suggesting that these landslides were triggered before 4211 ± 31 cal. yr. BP. The tephra H5 was also found in a peat area on the Tjarnadalir landslide (66°8’54”N and 19°1’50”W) in the outermost part of the Skagafjörður, which indicates a minimal age of 6100 yr. cal. BP for this landslide (Hafliðason, 1982). The presence of thick soil layers under these tephras indicates that sedimentation on the landslides started well before these volcanic events, suggesting that most landslides occurred during the Pleistocene-early Holocene transition, similar to the Höfðahólar and Vatn landslides. The timing between deglaciation and their activation remains uncertain, however, given the absence of chronological constraints on their maximal age. Most of them probably took place during the Pleistocene-Holocene transition, like the Vatn landslide, or during the early Holocene, like the Höfðahólar rock-avalanche. According to the age measurement results provided in this study, the Stífluhólar landslide occurred around 3400 to 8200 years after deglaciation, a time-lag very similar to those estimated for other landslides in Skagafjörður (Mercier et al., 2013) and elsewhere in the world (McColl, 2012; Ballantyne et al., 2014). 28The time-lag observed in Iceland and elsewhere between deglaciation and the triggering of landslides suggests that the bedrock response to deglaciation persists long after complete deglaciation. This time-lag also supports the hypothesis that deglaciated rock slopes can experience progressive rock-mass strength degradation and DSGSD development before the initiation of landslides and rock-avalanches. However, the existence of a causal link between DSGSD and landsliding is a controversial issue. The potential relationships between these two major gravitational slope processes have been addressed on the bases of surface observations (Evans and Couture, 2002; Mège and Bourgeois, 2011), correlations between spatial distributions of DSGSD and landslides (Capitani et al., 2013), cosmogenic age measurements and kinematic reconstruction of nested landforms (Bigot-Cormier et al., 2005), and numerical modeling (Bachmann et al., 2009). Many landslides and rock-avalanches in the world occurred on slopes that had previously experienced DSGSD. This is the case of the 1965 Hope rock-avalanche in British Columbia, which marks the abrupt termination of a DSGSD that had spanned the Holocene (Evans and Couture, 2002). However, Savigny and Clague (1992) observed that a significant part of its sliding plane consists of a dyke of altered material, suggesting that the landslide was also controlled by pre-existing structural weaknesses. In the central Italian Alps, DSGSD is commonly observed together with contiguous or nested landslides, and a temporal DSGSD-landslide succession has been proposed (Ambrosi and Crosta, 2006). By using cosmogenic age measurements on a slope affected by both DSGSD and landsliding in the French Alps, Bigot-Cormier et al. (2005) demonstrated that landsliding on this slope was controlled by previous DSGSD. In Tuscany (Italy), Capitani et al. 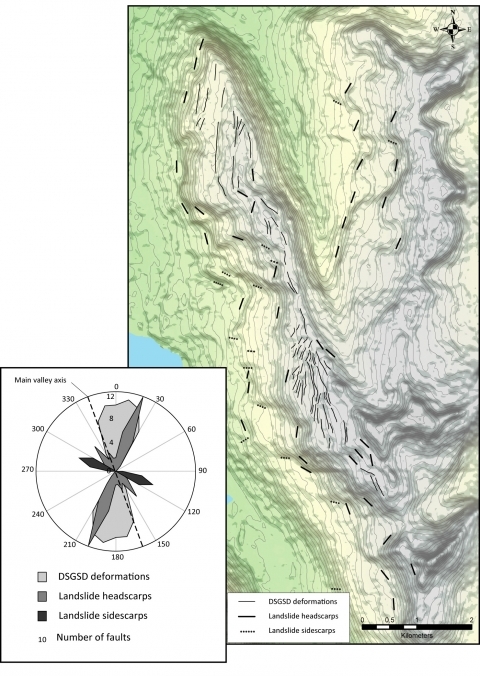 (2013) noted a positive correlation between the spatial distribution of DSGSD and landslides, and argued that DSGSD significantly affects landslide distribution. The relationship between DSGSD and landsliding has also been investigated in extraterrestrial locations: in the Valles Marineris (Mars), Mège and Bourgeois (2011) and Gourronc et al. (2014) interpreted a series of ridge-top depressions as grabens produced by DSGSD and argued that they had a genetic relationship with landslides on ridge slopes. 29However, the link between DSGSD and landsliding has been disputed. Many areas in the world are rich in landslides but do not display evidence of DSGSD (Evans et al., 2006). From a review of the pattern of RSFs in mountains, Hewitt et al. (2008) observed that many rock-avalanches occur in relatively massive lithologies which are not affected by DSGSD. Conversely, landslides are absent in many areas affected by DSGSD, suggesting that DSGSD is not a prerequisite to trigger them. 30The landslides on the Holtshyrna ridge, described here, seem to derive partly from DSGSD. This is not the case on the Hnjúkar ridge, 22 km south of the study area, which is deeply affected by DSGSD but where landslides are uncommon (Coquin et al., 2015). This means that landsliding is the result of a complex combination of several predisposing, preparatory and triggering controls that may vary from one location to another. 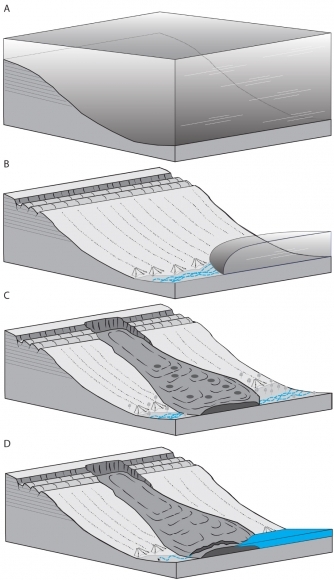 DSGSD may lead to the formation of distributed sub-vertical joints parallel to valley slopes, but these may not be sufficient to generate landslides by themselves, as uninterrupted detachment surfaces may be lacking. The existence of additional preconditioning factors (e.g. conform-dip slope bedding planes or pre-existing weakness planes) or triggering factors (e.g. seismic activity) may be necessary to trigger landsliding in areas affected by DSGSD. 31Controls of the DSGSD-landslide sequence are complex and include: (i) preconditioning factors, i.e. lithology and structure (rock-mass strength, layer dip, tectonic assemblage); (ii) preparatory factors, which contribute to reducing slope stability towards a critical threshold, including paraglacial readjustments (i.e. the rock-slope response to glacial unloading and debuttressing during and after the shrinking of glaciers) and (iii) triggering factors that go over the critical threshold beyond which the slope failure occurs (McColl, 2012). 32In the present case study, the main preconditioning contributor is related to the dipping of the bedrock basaltic sequence that conforms to the local topography, a pattern in favor of landsliding, and the presence of poorly cohesive layers intercalated between the basaltic piles. The basal sliding plane of the Stífluhólar is probably partly derived from one of these poorly cohesive layers (fig. 9). Fig. 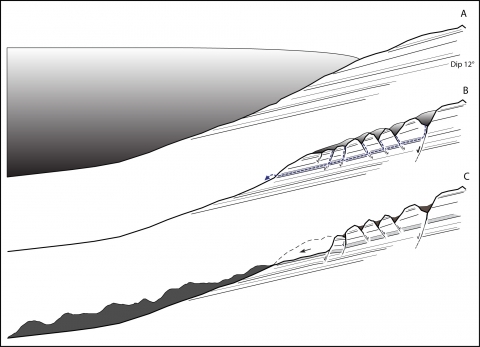 9 – Proposed transversal cross-profile evolution of the Stífluhólar slope during the Late Weichselian deglaciation. Fig. 9 – Evolution idéalisée du profil transversal le long du versant du Stífluhólar au cours de la déglaciation du Weichselien tardif. A: earlier stage of Late Weichselian deglaciation before 15 ka cal. yr. BP – the valley is still occupied by a glacier and slopes are stable; B: end of the Late Weichselian deglaciation around 15-13 ka cal. yr. BP. The upper slope is affected by DSGSD with sub-vertical joint propagation, resulting in the formation of a hummocky topographic surface with stepped ridges and depressions. Water supplied by permafrost thawing and snow-patch melting infiltrates the near-surface joints related to the DSGSD and springs out along the weakness planes of altered palagonite layers between the lava piles; C: Late Weichselian deglaciation – Holocene transition. Water infiltration weakens the palagonite layer and leads to the complete development of the failure plane and the triggering of the landslide event. A : Stade précoce de la déglaciation du Weichselien tardif avant 15 ka. cal. yr. BP – la vallée est occupée par un glacier et les pentes sont stables ; B : fin de la déglaciation du Weichselien tardif autour de 15 – 13 ka. cal. yr. BP. La partie haute du versant subi des déformations par étalement gravitaire avec le développement de joints sub-verticaux, provoquant la formation d’une topographie accidentée avec étagement de crêtes et de dépressions. Les eaux issues du dégel du pergélisol ainsi que de la fonte des névés s’infiltre le long des joints dans le substrat rocheux et ressurgissent à mi-pente, le long des lits rocheux altérés par des processus de palagonisation ; C : transition entre la déglaciation du Weichselien tardif et l’Holocène. L’infiltration des eaux fragilise les lits rocheux altérés et conduit au développement progressif du plan de faille et au déclenchement du glissement du Stífluhólar. 33The DSGSD timing reconstruction is based on two observations: (i) the excellent state of preservation of the DSGSD scarps and antiscarps over all the Holtshyrna ridge, which indicates that the DSGSD was initiated after or synchronously with the ice-sheet withdrawal during the Late Weichselian deglaciation (otherwise, glaciers would have destroyed these features) and (ii) the minimum age of 8200 ± 1400 cal. yr. BP of the landslide, which indicates that the DSGSD was initiated before this time. Hence, the DSGSD was activated during a sequence spanning between the Late Weichselian deglaciation and the early-Holocene (fig. 10). This lag-time between the Late Weichselian deglaciation and the onset of DSGSD suggests that deglaciation may have exerted an influence on DSGSD activation. However, surface exposure dating of the preserved slip facets along the antiscarps will be necessary to support the hypothesis of a temporal relation between DSGSD and the landslide of Stífluhólar. Fig. 10 – Chronological reconstruction of DSGSD and main landslide events, from the Last Glacial Maximum to the present day. Fig. 10 – Reconstitution chronologique de la séquence étalement gravitaire – glissement de terrain du Stífluhólar depuis le dernier maximum glaciaire jusqu’à nos jours. A: Last Glacial Maximum condition around 18 ka cal. yr. BP; B: initiation of the DSGSD along the upper slope of the Stífluhólar at the end of the Late Weichselian deglaciation, probably around 15 to 13 cal. yr. BP; C: before 9702 ± 1508 cal. yr. BP - activation of the landslide damming the valley floor, resulting in the formation of the Stífluvatn; D: present-day situation. A : situation durant le dernier maximum glaciaire autour de 18 ka. cal. yr. BP ; B : initiation des déformations par étalement gravitaire sur la partie du versant du Stífluhólar à la fin de la déglaciation du Weichselien tardif, autour de 15 à 13 ka. cal. yr. BP ; C : avant 9702 ± 1508 cal. yr. BP - déclenchement du glissement de terrain provoquant un barrage naturel dans le fond de vallée et la formation du lac de Stífluvatn ; D : situation actuelle. 34Considering the relatively low intrinsic gravitational potential of the Holtshyrna ridge, the DSGSD is probably primarily related to post-glacial unloading processes (i.e. joint propagation induced by rock stress release) rather than by rock slope steepening under glacial erosion processes. We suggest that, during deglaciation, the rock stress release first affected the deglaciated upper slopes while the lower ones were still occupied by glaciers. This differential stress redistribution along slopes generates a zone of tensile stress along upper slopes, resulting in the formation of neo-joints, parallel or sub-parallel to the valley axes and ice flows (Bovis, 1982). At the slope scale, the propagation of neo-joints beneath the surface was followed by the gravitational displacement of fractured masses, producing the DSGSD. These large-scale slope deformations led to the formation of a well-developed stair-case assemblage of ridge-crest grabens, scarps and antiscarps, which affected the entire mountain slope, typical of DSGSD (fig. 9). 35Only kinematic scenario assumptions can be proposed about the triggering controls as no field observations can be made about them. The transition from sub-critical slope instabilities in the form of DSGSD to a landslide can be either gradual (without involving a trigger) or more sudden (requiring a trigger). The propagation of joints along sub-vertical planes, cutting across the basaltic bedded piles, can be assisted by water infiltration along the fractures. Once the poorly cohesive intercalated sedimentary layers are reached, water can be rerouted along these bedding discontinuities, gradually reducing slope stability. Alternatively, rapid joint propagation can be assisted by earthquakes, rapidly completing the failure plane required for a landslide to occur. 36Surface observations and age measurements were carried out on the Holtshyrna ridge and the Stífluhólar landslide to address the question of possible spatial and temporal relationships between DSGSD and landsliding. 371/ The spatial distribution of DSGSD features around the landslide together with the analyses of the orientation of DSGSD features and landslide headscarps support the idea that landslides occurred along sliding planes initiated by DSGSD but further investigations are needed to clearly demonstrate this hypothesis. 382/ Age measurement results indicate that the landslide of Stífluhólar probably occurred between 15-13 ka cal. yr. BP and 8200 ± 1400 cal. yr. BP. 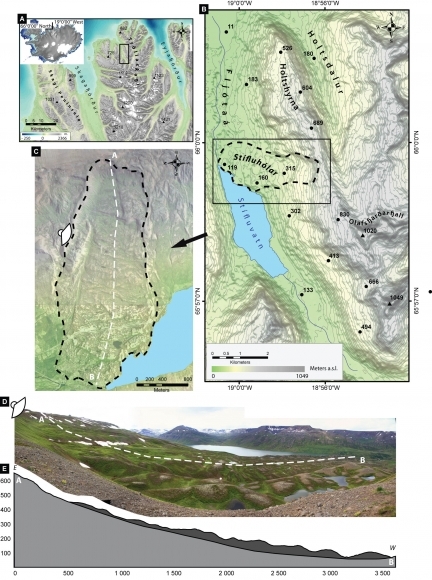 393/ This timing is in very broad agreement with previous studies on the dating of landslides in Skagafjörður and indicates a major paraglacial landslide activity which occurred in the region at the end-Pleistocene or at the early-Holocene. 404/ The initiation of DSGSD probably occurred before the main landslide event, probably after the Late Weichselian deglaciation. If so it would supports the idea that DSGSD acted as a precursor to landsliding on the Holtshyrna ridge, but comparisons with other examples in Northern Iceland and in the world indicate that DSGSD is only one failure mechanism among many involved in generating landslides and rock-avalanches. 41This study identifies the significant role of predisposing controls (i.e. the conform-dip slope of the bedding plane and the presence of intercalated poorly cohesive layers of palagonite between the lava piles) and the possible influence of the post-glacial DSGSD as a predisposing control on landslide activation. Agliardi F., Crosta G., Zanchi A. (2001) – Structural constraints on deep-seated slope deformation kinematics. Engineering Geology, 59, 83-102. Ambrosi C., Crosta G.B. (2006) – Large sackung along major tectonic features in the Central Italian Alps. Engineering Geology, 83, 183-200. Andrews J., Helgadóttir G. (2003) – Late Quaternary Ice Cap Extent and Deglaciation, Hunafloaáll, Northwest Iceland: Evidence from Marine Cores. Arctic, Antarctic, and Alpine Research, 35, 218-232. Andrews J.T., Hardardóttir J., Helgadóttir G., E. Jennings A., Geirsdóttir Á., Sveinbjörnsdóttir E., Schoolfield S., Kristjánsdóttir G.B., Smith L.M., Thors K. (2000) – The N and W Iceland Shelf : insights into Last Glacial Maximum ice extent and deglaciation based on acoustic stratigraphy and basal radiocarbon AMS dates. Quaternary Science Reviews, 19, 619-631. Arsenault A.M., Meigs A.J. (2005) – Contribution of deep-seated bedrock landslides to erosion of a glaciated basin in southern Alaska. Earth Surface Processes and Landforms, 30, 1111-1125. Augustinus P.C. (1995) – Rock mass strength and the stability of some glacial valley slopes. Zeitschrift für Geomorphologie, 39, 55-68. Bachmann D., Bouissou S., Chemenda A. (2009) – Analysis of massif fracturing during Deep-Seated Gravitational Slope Deformation by physical and numerical modeling. Geomorphology, 103, 130-135. Ballantyne C.K. (1986) – Landslides and slope failures in Scotland: A review. Scottish Geographical Magazine, 102, 134-150. Ballantyne C.K. (2002) – Paraglacial geomorphology. Quaternary Science Reviews, 21, 1935-2017. Ballantyne C.K. (2008) – After the Ice: Holocene Geomorphic Activity in the Scottish Highlands. Scottish Geographical Journal, 124, 8-52. Ballantyne C.K., Sandeman G.F., Stone J.O., Wilson P. (2014) – Rock-slope failure following Late Pleistocene deglaciation on tectonically stable mountainous terrain. Quaternary Science Reviews, 86, 144-157. Bigot-Cormier F., Braucher R., Bourlès D., Guglielmi Y., Dubar M., Stéphan J.F. (2005) – Chronological constraints on processes leading to large active landslides. Earth and Planetary Science Letters, 235, 141-150. Birks H.H., Gulliksen S., Haflidason H., Mangerud J., Possnert G. (1996) – New radiocarbon dates for the Vedde Ash and the Saksunarvatn Ash from western Norway. Quaternary Research, 45, 119-127. Björck S., IngóLfsson Ó., Haflidason H., Hallsdöttir M., Anderson N. (1992) – Lake Torfadalsvatn : a high resolution record of the North Atlantic ash zone I and the last glacial-interglacial environmental changes in Iceland. Boreas, 21, 15-22. Blaauw M. (2010) – Methods and code for ‘classical’ age-modelling of radiocarbon sequences. Quaternary Geochronology, 5, 512-518. Bouissou S., Darnault R., Chemenda A., Rolland Y. (2012) – Evolution of gravity-driven rock slope failure and associated fracturing : Geological analysis and numerical modelling. Tectonophysics, 526, 157-166. Bovis M.J. (1982) – Uphill-facing (antislope) scarps in the Coast Mountains, southwest British Columbia. Geological Society of America Bulletin, 93, 804-812. Bronk Ramsey C., Lee S. (2013) – Recent and planned developments of the program OxCal. Radiocarbon, 55, 720-730. Capitani M., Ribolini A., Federici P.R. (2013) – Influence of deep-seated gravitational slope deformations on landslide distributions: A statistical approach. Geomorphology, 201, 127-134. Caseldine C., Langdon P., Holmes N. (2006) – Early Holocene climate variability and the timing and extent of the Holocene thermal maximum (HTM) in northern Iceland. Quaternary Science Reviews, 25, 2314-2331. Coquin J., Mercier D., Bourgeois O., Cossart E., Decaulne A. 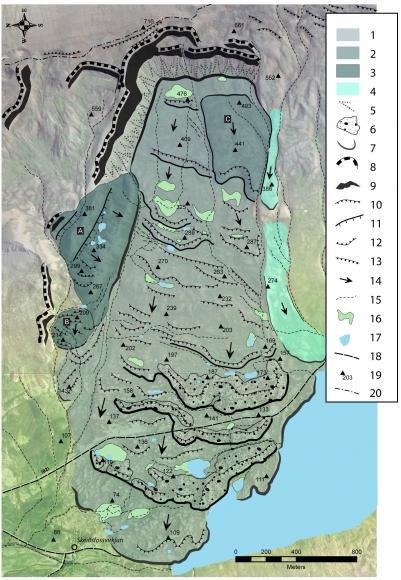 (2015) – Gravitational spreading of mountain ridges coeval with Late Weichselian deglaciation: impact on glacial landscapes in Tröllaskagi, northern Iceland. Quaternary Science Reviews, 107, 197-213. Cossart E., Mercier D., Decaulne A., Feuillet T., Jónsson H.P., Sæmundsson Þ. 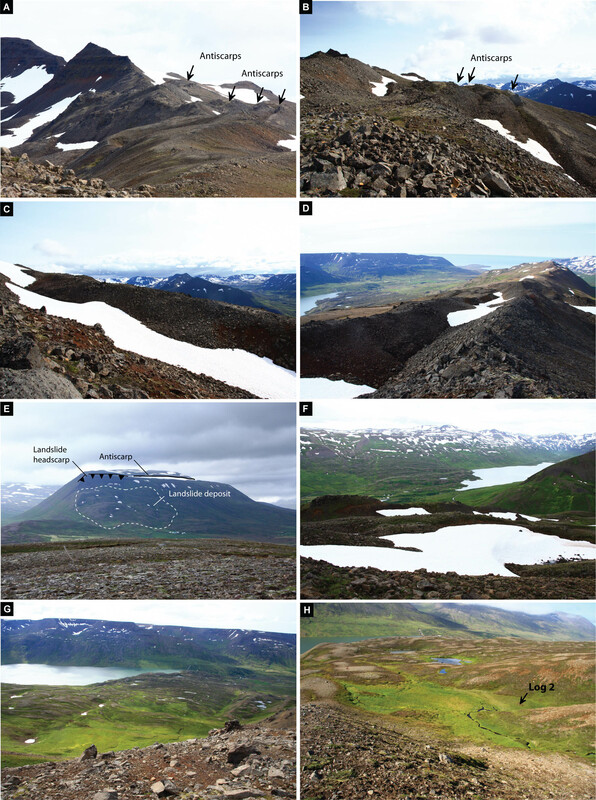 (2014) – Impacts of post-glacial rebound on landslide spatial distribution at a regional scale in northern Iceland (Skagafjörður). Earth Surface Processes and Landforms, 39, 336-350. Crosta G.B., Frattini P., Agliardi F. (2013) – Deep seated gravitational slope deformations in the European Alps. Tectonophysics, 605, 13-33. Cruden D.M., Hu X.Q. (1993) – Exhaustion and steady state models for predicting landslide hazards in the Canadian Rocky Mountains. Geomorphology, 8, 279-285. Dugmore A.J., Cook G., Shore J., Newton A.J., Edwards K.J., Larsen G. (1995) – Radiocarbon dating tephra layers in Britain and Iceland. Radiocarbon, 37, 379-388. Eiríksson J., Knudsen K.L., Haflidason H., Henriksen P. (2000) – Late-glacial and Holocene palaeoceanography of the North Icelandic shelf. Journal of Quaternary Science, 15, 23-42. Evans S., Scarascia Mugnozza G., Strom A., Hermanns R., Ischuk A., Vinnichenko S. (2006) – Landslides from massive rock slope failure and associated phenomena. In: Landslides from Massive Rock Slope Failure. Springer, 03-52. Evans S.G., Couture R. (2002) – The 1965 Hope Slide, British Columbia; catastrophic failure of a sagging rock slope. Geological Society of America, Abstracts with Programs, 16-26. Feuillet T., Coquin J., Mercier D., Cossart E., Decaulne A., Jónsson H.P. (2014) – Focusing on the spatial non-stationarity of landslide predisposing factors in northern Iceland : Do paraglacial factors vary over space ? Progress in Physical Geography, 38, 354-377. Garcia S., Arnaud N.O., Angelier J., Bergerat F., Homberg C. (2003) – Rift jump process in Northern Iceland since 10 Ma from 40Ar/39Ar geochronology. Earth and Planetary Science Letters, 214, 529-544. Geirsdóttir Á., Andrews J.T., Ólafsdóttir S., Helgadóttir G., Hardardóttir J. (2002) – A 36 Ky record of iceberg rafting and sedimentation from north-west Iceland. Polar Research, 21, 291-298. Geirsdóttir Á., Miller G.H., Axford Y., Sædís Ó. (2009) – Holocene and latest Pleistocene climate and glacier fluctuations in Iceland. Quaternary Science Reviews, 28, 2107-2118. Gourronc M., Bourgeois O., Mège D., Pochat S., Bultel B., Massé M., Mercier D. (2014) – One million cubic kilometers of fossil ice in Valles Marineris : Relicts of a 3.5 Gy old glacial landsystem along the Martian equator. Geomorphology, 204, 235-255. Grönvold K., Óskarsson N., Johnsen S.J., Clausen H.B., Hammer C.U., Bond G., Bard E. (1995) – Ash layers from Iceland in the Greenland GRIP ice core correlated with oceanic and land sediments. Earth and Planetary Science Letters, 135, 149-155. Guðbergsson G. (1975) – Myndun móajarðvegs í Skagafirði. J. Agr. Res. Icel., 7, 20-45. Hafliðason H. (1982) – Jarðfræðiskýrsla vegna jarðsigs á Almenningum við Siglufjörð. Unnið fyrir: Vegagerð ríkisins, 15 bls. Hewitt K. (2009) – Glacially conditioned rock-slope failures and disturbance-regime landscapes, Upper Indus Basin, northern Pakistan. Geological Society, London, Special Publications, 320, 235-255. Hewitt K., Clague J.J., Orwin J.F. 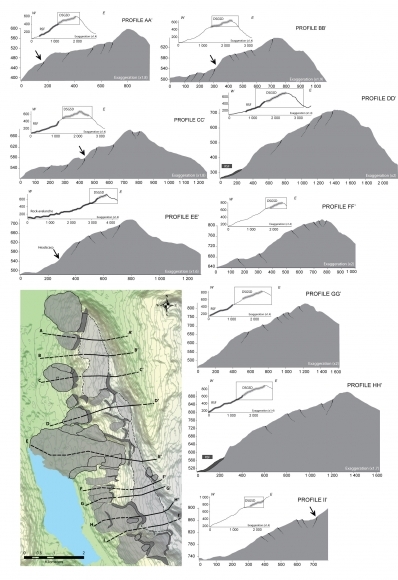 (2008) – Legacies of catastrophic rock slope failures in mountain landscapes. Earth-Science Reviews, 87, 1-38. Hippolyte J.C., Brocard G., Tardy M., Nicoud G., Bourlès D., Braucher R., Souffaché B. (2006) – The recent fault scarps of the western Alps (France) : tectonic surface ruptures or gravitational sackung scarps ? A combined mapping, geomorphic, levelling, and 10Be dating approach. Tectonophysics, 418, 255-276. Ingólfsson Ó., Norddahl H. (1994) – A review of the environmental history of Iceland, 13 000-9000 yr BP. Journal of Quaternary Science, 9, 147-150. Jarman D. (2006) – Large rock slope failures in the Highlands of Scotland: characterisation, causes and spatial distribution. Eng. Geol., 83, 161-182. Jarman D., Ballantyne C.K. (2002) – Beinn Fhada, Kintail: an example of large‐scale paraglacial rock slope deformation. The Scottish Geographical Magazine, 118, 59-68. Jóhannesson H., Sæmundsson K. (2009) – Geological Map of Iceland. 1:600 000. Tectonics. Reykjavik: Icelandic Institute of Natural History. Jónsson H.P., (2005) – Gjóskulög í Skagafirði. BSc. Thesis, Department of earth Sciences, University of Iceland, 60 p.
Jónsson Ó., (1957) – Skriðuföll og snjóflóð. Bókaútgáfan norðri, p. 141. Kellerer-Pirklbauer A., Proske H., Strasser V. (2010) – Paraglacial slope adjustment since the end of the Last Glacial Maximum and its long-lasting effects on secondary mass wasting processes: Hauser Kaibling, Austria. Geomorphology, 120, 65-76. Larsen G., Eiríksson J. (2008) – Holocene tephra archives and tephrochronology in Iceland–a brief overview. Jökull, 58, 229-250. Larsen G., Þórarinsson S. (1977) – H4 and other acid Hekla tephra layers. Jökull, 27, 28-46. McColl S.T. (2012) – Paraglacial rock-slope stability. Geomorphology, 153-154, 1-16. Mège D., Bourgeois O. (2011) – Equatorial glaciations on Mars revealed by gravitational collapse of Valles Marineris wallslopes. Earth and Planetary Science Letters, 310, 182-191. Mercier D., Cossart E., Decaulne A., Feuillet T., Jónsson H.P., Sæmundsson Þ. (2013) – The Höfðahólar rock avalanche (sturzström) : Chronological constraint of paraglacial landsliding on an Icelandic hillslope. The Holocene, 23, 432-446. Norðdahl H., Pétursson H.G. (2005) – Relative sea-level changes in Iceland: new aspects of the Weichselian deglaciation of Iceland. In Iceland–Modern Processes and Past Environments. Amsterdam, Elsevier, 25-78. Pétursson H.G., Sæmundsson þ. (2008). – Skriðuföll í Skagafirði, In : Sæmundsson þ., Decaulne A., Jónsson H.P. (Eds. ), Skagfirsk náttúra 2008, Náttúrustofa Norðurlands vestra NNV, Sauðárkrókur, 02, 25-30. Reimer P., Bard E., Bayliss A., Beck J.W., Blackwell P.G., Ramsey C.B., Grootes P.M. (2013) – IntCal13 and Marine13 radiocarbon age calibration curves 0-50,000 years cal BP. Radiocarbon, 55, 1869-1887. Roaldset E. (1983) – Tertiary (Miocene-Pliocene) interbasalt sediments, NW- and W-Iceland. Jökull, 33, 39-56. Savigny W., Clague J.J. (1992) – Technical Tour no. 2; Fraser Valley and Fraser Canyon areas. Technical Tour Guidebook, May 7, 1992. BiTech Publishers, Vancouver, BC, 47-99. Stötter J., Wastl M., Caseldine C., Häberle T. (1999) – Holocene palaeoclimatic reconstruction in northern Iceland: approaches and results. Quaternary Science Reviews, 18, 457-474. Thordarson T., Höskuldsson Á. (2008) – Postglacial volcanism in Iceland. Jökull, 58, 197-228. Whalley W., Douglas G., Jonsson A. (1983) – The magnitude and frequency of large rockslides in Iceland in the Postglacial. Geografiska Annaler: Series A, Physical Geography, 65A, 99-110. Wilson P., Smith A. (2006) – Geomorphological characteristics and significance of late quaternary paraglacial rock–slope failures on Skiddaw Group terrain, Lake District, northwest England. Geografiska Annaler: Series A, Physical Geography, 88, 237-252. Zischinsky U. (1966) – On the deformation of high slopes. Proc. 1st Congr. Int. Soc. Rock Mechanics, 2, 179-185. Une attention croissante est portée par la communauté des géomorphologues à l’analyse des conséquences de la déglaciation sur les reliefs des milieux froids (Bovis, 1982 ; Whalley et al., 1983 ; Ballantyne, 2002 ; Ballantyne et al., 2014 ; Arsenault and Meigs, 2005 ; Jarman, 2006 ; Wilson and Smith, 2006 ; Hewitt, 2009 ; McColl, 2012 ; Crosta et al., 2013 ; Mercier et al., 2013 ; Cossart et al., 2014). Les versants désenglacés sont soumis à des processus de déstabilisation et de déformation qui s’expriment selon des modalités variées : glissements de terrain, avalanches rocheuses, étalement gravitaire. L’étalement gravitaire se traduit par le développement de fractures et de failles essentiellement parallèles aux courbes de niveau et le long desquelles les blocs individualisés vont se déplacer, donnant naissance à des grabens le long des crêtes et à des escarpements à regards amont ou aval le long des parties supérieures des versants (Agliardi et al., 2001 ; Mège et Bourgeois, 2011). Les facteurs de contrôle qui commandent le développement de ces déformations par étalement gravitaire sont multiples : décohésion post-glaciaire, disparition des soutènements le long de pentes rendues particulièrement abruptes par le travail de l’érosion glaciaire (Zichinsky, 1966 ; Augustinus, 1995 ; Ballantyne, 2002), regain d’activité sismique lié aux réajustements glacio-isostatiques de la croûte terrestre (Agliardi et al., 2001 ; Hippolyte et al., 2006 ; McColl, 2012 ; Cossart et al., 2014). Les relations entre étalement gravitaire et mouvements de masse sont encore peu connues. Peu de travaux se sont intéressés au rôle potentiel des déformations par étalement gravitaire dans la mise en place des mouvements de masse. Dans cette étude on cherche donc à identifier les relations spatiales entre les déformations par étalement gravitaire et les mouvements de masse ainsi que les relais qui sont susceptibles de conduire, dans le temps, d’un processus à l’autre. Située dans le nord de l’Islande, la péninsule montagneuse du Tröllaskagi représente un terrain de recherche adapté pour alimenter la réflexion sur ces questions dans la mesure où de nombreux versants présentent des déformations par étalement gravitaire et des mouvements de masse. Dans cette étude, on s’intéresse plus précisément au massif basaltique du Holtshyrna, localisé à l’extrémité nord de la péninsule. Son versant ouest présente dans sa partie supérieure de nombreuses déformations par étalement gravitaire tandis que sa partie inférieure est affectée par de nombreux mouvements de masse. Observations géomorphologiques et cartographie des déformations sont réalisées conjointement avec des datations du glissement du Stífluhólar dont le dépôt a barré la vallée et provoqué la formation d’un lac de barrage à l’amont, le Stífluvatn. Des fosses ont été excavées dans les tourbières localisées dans les petites dépressions fermées qui jalonnent le glissement à la recherche d’éléments datables – couches de cendres volcaniques (tephras) et macro-restes végétaux – dans le but de proposer de nouveaux jalons chronologiques de l’activité paraglaciaire dans la région et de préciser le relais des processus de déformation du versant au cours de la séquence paraglaciaire. - Les observations de terrain indiquent que les mouvements de masse se développent initialement le long de plans de rupture générés au préalable par la dynamique d’étalement gravitaire, ce qui souligne l’influence significative des déformations par étalement gravitaire dans l’amorce des mouvements de masse, au moins à l’échelle du site d’étude. - L’analyse des orientations de failles associées aux déformations par étalement gravitaire et des niches d’arrachement des mouvements de masse supporte aussi l’hypothèse d’un contrôle de l’étalement gravitaire dans la mise en place des mouvements de masse. Des études complémentaires portant sur l’analyse détaillée des fractures liées à l’étalement gravitaire ainsi qu’aux plans de glissement sont néanmoins nécessaires pour confirmer cette hypothèse. - Les éléments de datation obtenus dans les tourbières situées à la surface du glissement du Stífluhólar suggèrent que la séquence de mise en place du glissement à probablement eu lieu après la fin de la déglaciation du Weichselien tardif (entre 15 et 13 ka) et avant 8200 ± 1400 ans (âge calibré). - Cette chronologie est conforme aux travaux de datation consacrés à d’autres glissements dans la région (Mercier et al., 2013 ; Decaulne et al., 2016) et ailleurs dans le monde (McColl, 2012 ; Ballantyne et al., 2014) et vient confirmer l’existence d’une période de déstabilisation gravitaire des versants suite à la déglaciation du Weichselien tardif. Fig. 1 – Location maps. Fig. 1 – Cartes de localisation. A: Location map of the study area in Iceland; B: location map of the Stífluhólar landslide in the Holtshyrna ridge; C: aerial orthophoto of the Stífluhólar landslide; D: panoramic photograph looking south with the main landslide deposit in the foreground and Lake Stífluvatn in the background; E: interpretative transversal profile of the main landslide.A : Carte de localisation du secteur d’étude en Islande ; B : carte de localisation du glissement de terrain du Stífluhólar dans le massif du Holtshyrna ;C : orthophoto du glissement de terrain du Stífluhólar ; D : photographie panoramique prise vers le sud avec vue sur le dépôt principal de glissement au premier plan et avec le lac du Stífluvatn au second plan ; E : profil topographique interprétatif du principal glissement de terrain. Fig. 2 – Morphological map of the Holtshyrna ridge.Fig. 2 – Carte morphologique du massif du Holtshyrna. 1: Crestline; 2: Area affected by DSGSD; 3: DSGSD features; 4: Landslides;5: Drainage; 6: Lake; 7: Dip of lava pile. 1 : ligne de crête ; 2 : Secteur affecté par les déformations par étalement gravitaire ; 3 : Déformation par étalement gravitaire ; 4 : Glissement de terrain ; 5 : Réseau hydrographique ; 6 : Lac ; 7 : Pendage de la pile de lave. Fig. 3 – Transverse elevation profiles along the Holtshyrna ridge extracted from the ASTER DEM.Fig. 3 – Profils d’altitude transversaux réalisés le long du massif du Holtshyrna et extraits à partir du MNT ASTER. Note the transition between the upper slopes affected by DSGSD and the lower slopes affected by landslides. Noter la transition entre la partie haute du versant soumise au processus de déformation par étalement gravitaire et la partie basse, affectée par des glissements de terrain. Fig. 4 – Views of the Holtshyrna ridge geomorphological units (DSGSD and landslide features).Fig. 4 – Vues sur les entités géomorphologiques du massif du Holtshyrna (déformations par étalement gravitaire et glissements). A: View southward from the upper slope adjacent to the Stífluhólar landslide – the ridge is affected by a DSGSD, resulting in the formation of de-doubled ridges and arcuate counterscarps aligned with slopes; B: View of the southern upper slope adjacent to the Stífluhólar – note the succession of stair-cased linear counterscarps 5-8 m in height aligned with slopes; C: View within a DSGSD counterscarp; D: View toward the north. Note the deformations related to the DSGSD in the foreground and the distal part of the Stífluhólar landslide deposit in the background; E: View to the northernmost part of the Holtshyrna mountain side – note that the steep landslide headscarp is aligned on the upslope DSGSD scarps (outlined by snow-patches); F: View toward the Stífluhólar landslide from the opposite valley-side – note that the deposit has dammed the valley floor, resulting in the formation of the Stífluvatn upstream; G: View toward the Stífluhólar landslide deposit from the northern upper slope adjacent to the landslide; H: View toward the distal part of the Stífluhólar landslide deposit, looking northwest. Log 2 was excavated within the peat area in the foregroundA : vue vers le sud depuis le versant adjacent au Stífluhólar – la crête a subi des déformations par étalement gravitaire, provoquant la formation de crêtes dédoublées et d’escarpements à regard amont sur les versants adjacents ;B : vue sur la partie haute du versant, directement au sud du Stífluhólar – noter la succession d’escarpements à regard amont, de 5 à 8 m de hauteur, étagés et alignés sur les courbes de niveau ; C : vue sur le revers d’un escarpement à regard amont ; D : vue vers le nord. Noter au premier plan les déformations par étalement gravitaire et à l’arrière-plan, la partie distale du dépôt de g du Stífluhólar ; E : vue sur la partie nord du massif du Holtshyrna – noter que le plan de glissement est aligné sur les déformations par étalement gravitaire de la partie haute du versant (soulignées par les névés) ; F : vue sur le glissement de terrain du Stífluhólar depuis le versant opposé – noter que le dépôt a barré le fond de vallée, provoquant la formation en amont du lac de Stífluvatn ; G : Vue sur le dépôt de glissement du Stífluhólar depuis la partie supérieure nord du versant ; H : Vue sur la partie distale du dépôt de glissement du Stífluhólar, vers le nord-ouest. Au premier plan, la fosse 2 qui a été excavée dans une tourbière. Fig. 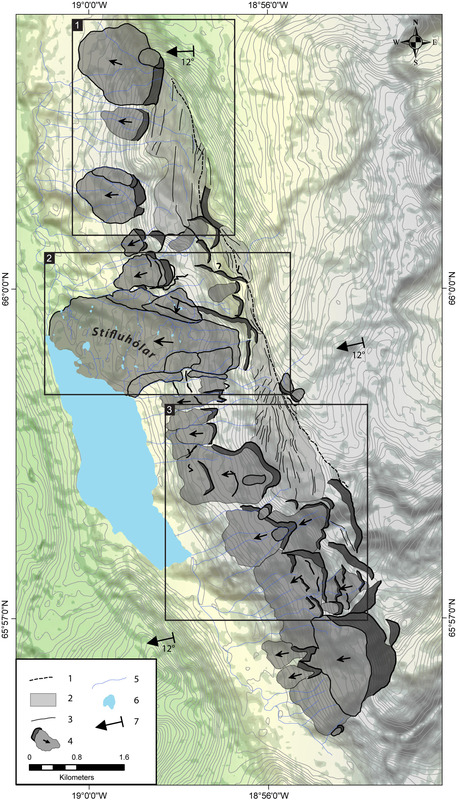 5 – Geomorphological map of the Stífluhólar landslide.Fig. 5 – Carte géomorphologique du glissement de terrain du Stífluhólar. 1: Main landslide deposit; 2: Secondary translational landslide deposit;3: Rotational landslide; 4: Other slope deposits; 5: Scree; 6: Main transversal ridges; 7: Contour of landslide deposit; 8: Landslide scarp; 9: Sliding plane; 10: Break-in-slope; 11: Fault; 12: Counterscarp; 13: DSGSD scarps; 14: Direction of slide; 15: Drainage; 16: Peat bog area; 17: Lake; 18: Road; 19: Elevation point; 20: Ridge crest.1 : Dépôt de glissement principal ; 2 : dépôt de glissement translationnel secondaire ; 3 : glissement rotationnel ; 4 : Autre dépôts de pente ; 5 : éboulis ; 6 : principaux bourrelets de glissement ; 7 : contours de glissement ; 8 : escarpement de glissement ; 9 : plan de glissement ; 10 : rupture de pente ; 11 : faille ; 12 : escarpement à regard amont ; 13 : déformation par étalement gravitaire ; 14 : direction du glissement ; 15 : réseau hydrographique ; 16 : tourbière ; 17 : lac ; 18 : route ; 19 : altitude ; 20 : Ligne de crête. Fig. 6 – Orientation of DSGSD features compared with orientation of landslide headscarps and sidescarps. Fig. 6 – Orientations des structures de déformation par étalements gravitaire comparée à celle des escarpements frontaux et latéraux des glissements de terrain. Both display a similar orientation.Ils présentent tous des orientations similaires. Tab. 1 – 14C radiocarbon age measurement.Tab. 1 – Dates radiocarbone. Fig. 7 – The Stífluhólar landslide.Fig. 7 – Le glissement de terrain du Stífluhólar. A: location of the log sections mapped on an aerial view of the Stífluhólar landslide. 1: landslide scarps; 2: landslide transverse ridges. B: upper part of the log 6 section dug in the landslide deposit. In light ocher, tephras H3 and H4.C: lower part of the log 4 section dug in the peat bog area. Light patches correspond to wood remnants. D: sediment profiles and interpretation of deposits. 1: soil; 2: soil with clasts; 3: clay; 4: hard black sandy clay; 5: minerogenic; 6: peat; 7: peat with wood remnants; 8: wood remnants; 9: tephra ash layers. A : localisation des fosses cartographiées sur l’orthophoto du glissement de terrain du Stífluhólar. 1 : escarpement de glissement ; 2 : bourrelets de glissement. B : partie supérieure de la fosse 6 excavée sur le glissement. En ocre clair, les tephras H3 et H4. C : partie inférieure de la fosse 4 excavée dans une tourbière. Les taches claires correspondent à des macro-restes végétaux. D : profils sédimentaires et interprétation des unités stratigraphiques. 1 : sol ; 2 : sol avec cailloux ; 3 : argile ; 4 : argile à sable noir induré ; 5 : lits de cailloutis ; 6 : tourbe ; 7 : tourbe avec macro-restes végétaux ; 8 : macro-restes végétaux ; 9 : couches de tephras. Fig. 8 – Age/Depth plot carried out for the pit 2.Fig. 8 – Graphique Age/Profondeur réalisé sur la section 2. The age is obtained on the basis of a linear extrapolation function.L’âge est obtenu sur la base d’une fonction d’extrapolation linéaire. Tab. 2 – Age-depth model results.Tab. 2 – Résultats du modèle âge-profondeur. Fig. 9 – Proposed transversal cross-profile evolution of the Stífluhólar slope during the Late Weichselian deglaciation.Fig. 9 – Evolution idéalisée du profil transversal le long du versant du Stífluhólar au cours de la déglaciation du Weichselien tardif. A: earlier stage of Late Weichselian deglaciation before 15 ka cal. yr. BP – the valley is still occupied by a glacier and slopes are stable; B: end of the Late Weichselian deglaciation around 15-13 ka cal. yr. BP. The upper slope is affected by DSGSD with sub-vertical joint propagation, resulting in the formation of a hummocky topographic surface with stepped ridges and depressions. Water supplied by permafrost thawing and snow-patch melting infiltrates the near-surface joints related to the DSGSD and springs out along the weakness planes of altered palagonite layers between the lava piles; C: Late Weichselian deglaciation – Holocene transition. Water infiltration weakens the palagonite layer and leads to the complete development of the failure plane and the triggering of the landslide event.A : Stade précoce de la déglaciation du Weichselien tardif avant 15 ka. cal. yr. BP – la vallée est occupée par un glacier et les pentes sont stables ; B : fin de la déglaciation du Weichselien tardif autour de 15 – 13 ka. cal. yr. BP. La partie haute du versant subi des déformations par étalement gravitaire avec le développement de joints sub-verticaux, provoquant la formation d’une topographie accidentée avec étagement de crêtes et de dépressions. Les eaux issues du dégel du pergélisol ainsi que de la fonte des névés s’infiltre le long des joints dans le substrat rocheux et ressurgissent à mi-pente, le long des lits rocheux altérés par des processus de palagonisation ; C : transition entre la déglaciation du Weichselien tardif et l’Holocène. L’infiltration des eaux fragilise les lits rocheux altérés et conduit au développement progressif du plan de faille et au déclenchement du glissement du Stífluhólar. Fig. 10 – Chronological reconstruction of DSGSD and main landslide events, from the Last Glacial Maximum to the present day.Fig. 10 – Reconstitution chronologique de la séquence étalement gravitaire – glissement de terrain du Stífluhólar depuis le dernier maximum glaciaire jusqu’à nos jours. A: Last Glacial Maximum condition around 18 ka cal. yr. BP; B: initiation of the DSGSD along the upper slope of the Stífluhólar at the end of the Late Weichselian deglaciation, probably around 15 to 13 cal. yr. BP; C: before 9702 ± 1508 cal. yr. BP - activation of the landslide damming the valley floor, resulting in the formation of the Stífluvatn; D: present-day situation.A : situation durant le dernier maximum glaciaire autour de 18 ka. cal. yr. BP ; B : initiation des déformations par étalement gravitaire sur la partie du versant du Stífluhólar à la fin de la déglaciation du Weichselien tardif, autour de 15 à 13 ka. cal. yr. BP ; C : avant 9702 ± 1508 cal. yr. BP - déclenchement du glissement de terrain provoquant un barrage naturel dans le fond de vallée et la formation du lac de Stífluvatn ; D : situation actuelle. Julien Coquin, Denis Mercier, Olivier Bourgeois, Thierry Feuillet et Armelle Decaulne, « Is gravitational spreading a precursor for the Stífluhólar landslide (Skagafjörður, Northern Iceland)? », Géomorphologie : relief, processus, environnement, vol. 22 – n° 1 | 2016, 9-24. Université de Nantes – Nantes, France • CNRS, UMR 6554 LETG Géolittomer – Nantes, France • CNRS, UMR 6112, Laboratoire de Planétologie et Géodynamique de Nantes - Nantes, France • CNRS, GDR 3062 Mutations polaires – France • OSUNA, Observatoire des Sciences de l’Univers Nantes Atlantique – Nantes, France (julien.coquin@wanadoo.fr) Tél : +33 2 53 48 76 77. Université Paris-Sorbonne – CNRS-UMR 8185 ENeC – Paris, France. • CNRS, GDR 3062 Mutations polaires – France • Institut Universitaire de France – Paris, France (Denis.Mercier@paris-sorbonne.fr). John Wiley & Sons Ltd, 2018, Oxford, 454 p.
L’Harmattan, 2017, Paris, 404 p.
EDP Sciences, collection « La Terre à Portée de main », Muséum National d’Histoire Naturelle, 2017, Paris, 108 p.
Université de Nantes – Nantes, France. • CNRS, UMR 6112, Laboratoire de Planétologie et Géodynamique de Nantes – Nantes, France • OSUNA, Observatoire des Sciences de l’Univers Nantes Atlantique – Nantes, France (Olivier.Bourgeois@univ-nantes.fr). CNRS, GDR 3062 Mutations polaires – France • Université Paris 8 – Vincennes Saint-Denis – Paris, France (Thierry.Feuillet@univ-paris8.fr). CNRS, UMR 6554 LETG Géolittomer – Nantes, France • CNRS, GDR 3062 Mutations polaires – France • OSUNA, Observatoire des Sciences de l’Univers Nantes Atlantique – Nantes, France (Armelle.Decaulne@univ-nantes.fr).